There is something so tasty about curry and coconut milk. It’s a combination that’s creamy and usually prepared with lemongrass, chilies and spices. It’s also versatile and goes with anything from veggies to meats to noodles. Homemade green curry is better, and it’s not hard to make, but I understand now that not everyone wants to make their own everything (yup, that was shocking for me learn! )…and sometimes we just want things to be just plain simple. 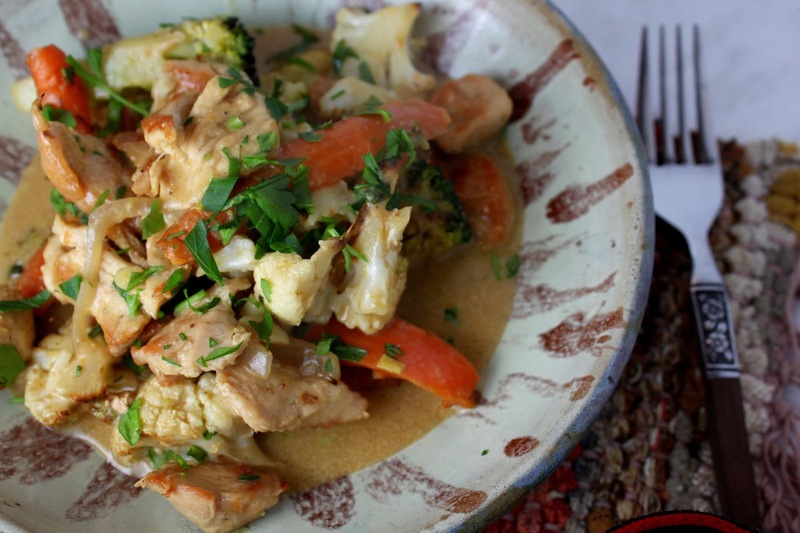 Enter this flavorful Turkey and Vegetable Green Curry. Cook the meat, add in roasted veggies with a few spoons of prepared green curry and coconut milk, and you have a meal in less than 20 minutes. I prefer roasting the veggies separately, but you could add them directly to the pan and skip that step. Use what you have on hand. No broccoli? Add in squash, or sweet potato or zucchini. You could even skip the turkey and go straight veggies. If you like extra spice in your dishes, add a few slices of jalapenos to really bring zing. Make it yours! Make it tonight. It’s a warm, hearty yet light and filling, easy Fat and Happy curry dish that you’ll want to make again. Chop the carrots, cauliflower and broccoli into pieces. Toss with 1 tablespoon of coconut oil and cumin, lay on a parchment-lined sheet pan and sprinkle with a bit of salt and pepper. Place in 425 degree oven for 15 minutes or until roasted and fork tender, turning the veggies once during cooking. While the veggies are cooking, heat the remaining tablespoon of coconut oil in a medium to large skillet pan. Thinly slice the turkey to bite size pieces and add to the pan. Season the turkey with a bit of salt and pepper. Cook over medium-high heat until the turkey is browned and cooked. Should take less than 10 minutes. Add the garlic and onions to the pan, toss and cook for minute or two. Add in the curry paste and allow the paste to become fragrant (about a minute or two). Your pan will most likely be dry at this point. Deglaze the pan with water, and then add in the coconut milk and whisk to combine. Cover and let simmer until the veggies are done. Add the veggies and toss well to coat. Sprinkle with the fresh mint and basil (or cilantro). Serve immediately as is or over rice with a fresh lime slice. Happy Healthy Tips: Today is a great day to start buying better meat. Free range, non-GMO, organic if you can get it. The taste is better, and it’s better for you!